Ear pain can be annoying and distracting. Similasan Earache Relief helps manage symptoms with a unique combination of natural active ingredients. These ingredients work together to support your body's natural ability to find relief. Similasan ear drops provide temporary relief by helping to soothe the root cause of ear pain and restore comfort. Q: How often should I use the ear drops? A: The recommended dose is 4-5 drops per ear as needed. Keep drops in ear for 3-5 minutes. Continue use until symptoms diminish, up to 4 times daily for up to 48 hours, or as directed by a doctor. Q: Do Similasan ear products contain preservatives? 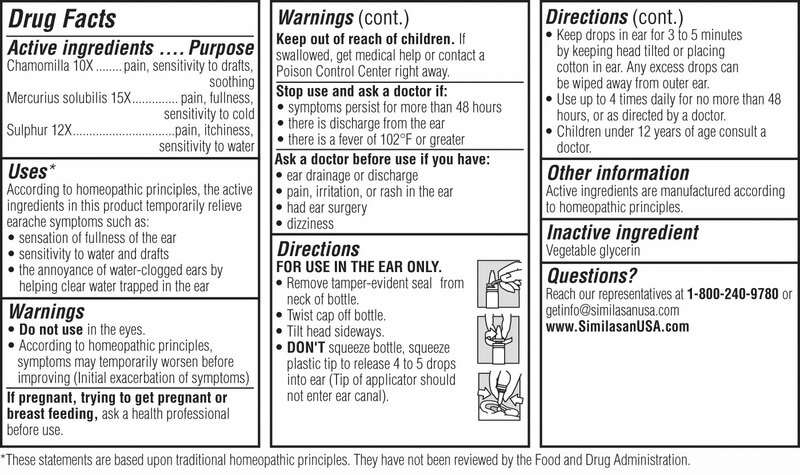 A: Similasan ear products are preservative free.